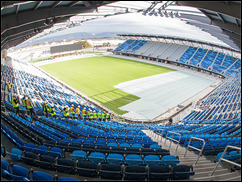 SAN JOSE, CA (CelebrityAccess) — The San Jose Earthquakes announced they have signed a long-term ticketing products and services partnership for Avaya Stadium with Live Nation's Ticketmaster division. The agreement will provide a number of new features for the team's fans, including an improved account manager for season ticket holders to more readily transfer their tickets to others, as well as additional re-sale options and the ability to print match tickets at home for free. Additionally, Earthquakes tickets will now be available at select Ticketmaster locations, including Walmart and Chavez Supermarkets.